Websites allow local businesses to market themselves to a global audience. What is the use in putting your website online to market your products in another territory if your potential customers can’t understand your message. There are loads of different online translation aids that can automatically translate the text of your website into virtually any language however these are incredibly unreliable and can jumble up the message you are trying to deliver. We can arrange translations into all major european languages as well as more exotic foreign languages including Chinese and Arabic. 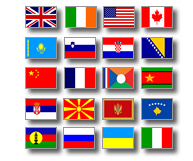 Your website can then have a number of flags or other symbols directing foreign visitors to that specific translation. Contact us today for a quote to have your website translated.